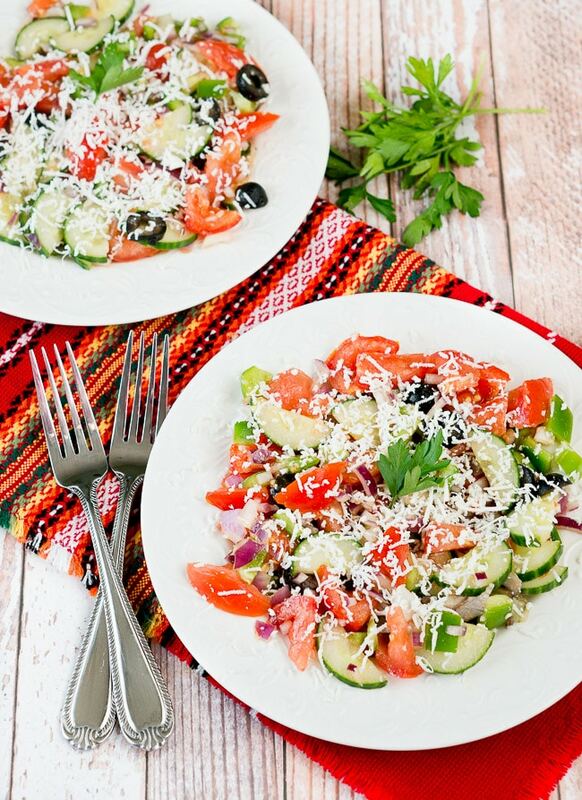 Shopska salad is a traditional Bulgarian salad made with tomatoes, cucumbers, bell pepper, onion, olives, seasoned with extra virgin olive oil and salt. It’s topped with finely grated feta cheese. Traditionally, we use white brine cheese called ‘sirene’ (the word in Bulgarian has nothing to do with sirens. haha :)) which is made of goat’s milk, sheep milk, and cow milk. It is very similar to Greek feta cheese which is very popular here in the States, that’s why I used feta cheese. 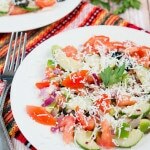 The name of the salad comes from the region Shopluk which is an area roughly where Bulgaria, Serbia, and Macedonia meet. 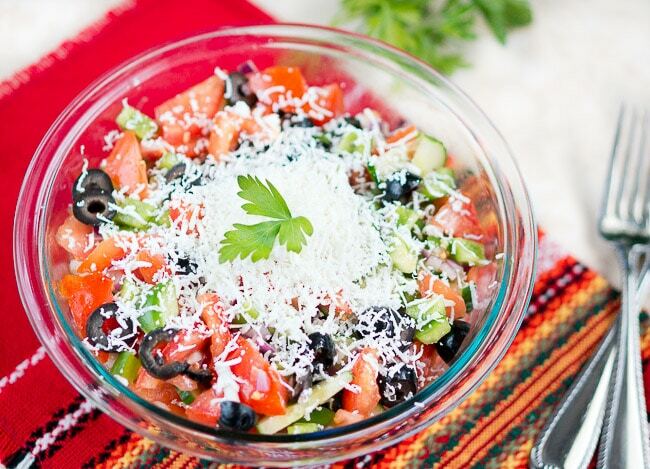 This Shopska salad is a wonderful side dish to your next BBQ. Serve it along side grilled chicken or steak. 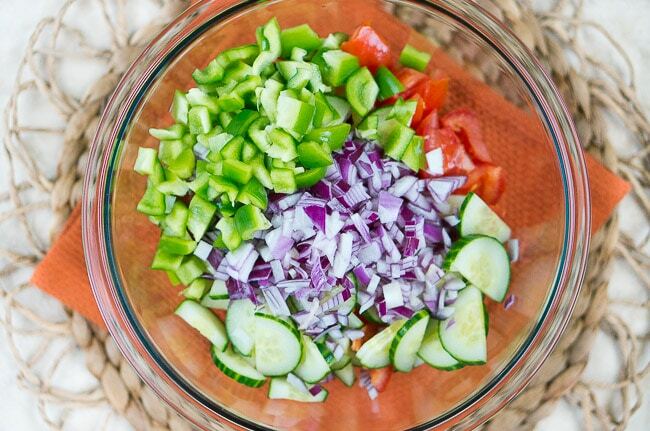 It is a super healthy salad that is also easy peasy to make. The ingredients are simple and it literally takes about 10 – 15 minutes to prepare. This salad serves 4-6 people depending on your appetites. 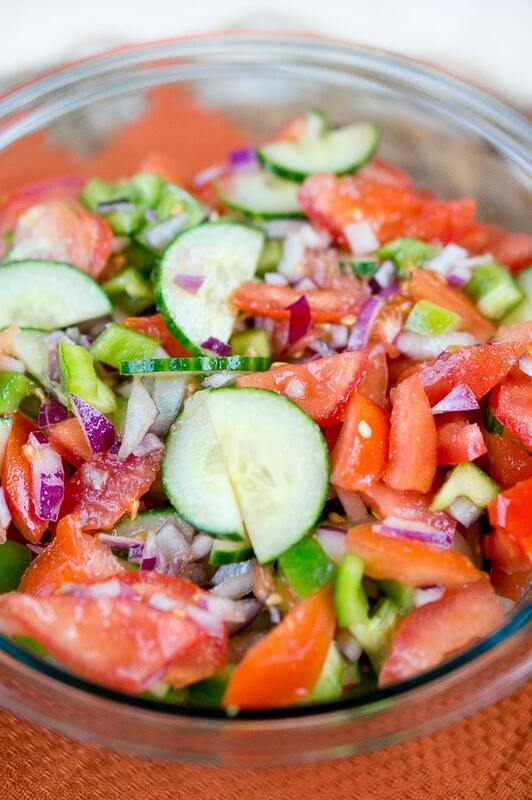 In a large bowl mix together tomatoes, cucumber, green bell peppers, red onion, and olives. Season with olive oil, and salt. Sprinkle the feta cheese over the salad so that it’s nicely covered. Serve immediately or chill before serving. Hope you enjoy it! 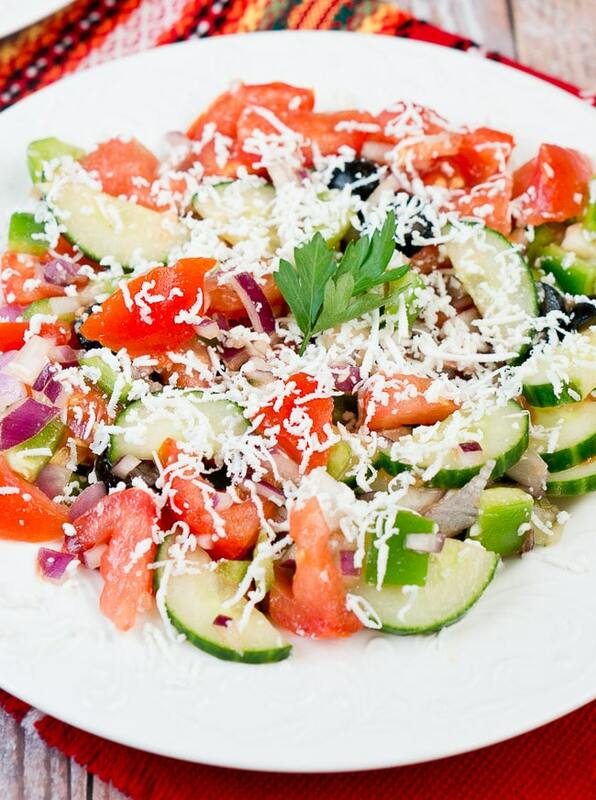 Shopska salad is a Bulgarian salad of tomatoes, cucumbers, bell pepper, onion, olives, seasoned with olive oil and salt, and topped with grated feta cheese. Sprinkle the feta cheese over the salad so that it's nicely covered. I love the sound of all the crunch in this salad, and it would make a great potluck dish, as you say. This reminds me of a Greek salad, which is one of my faves. So tasty! What a great looking salad! Can’t wait to try it. I love cheese in a salad and this sounds perfect with grilled meat!